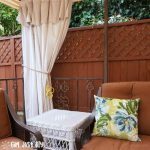 How to Paint a Rug the Easy Way - Girl, Just DIY! If you’re tired of the old natural fiber rug you have, or it’s been water damaged like mine was , don’t throw it out. I’ll show you how to paint a rug and make it look brand new. The best part about this project is it’s super fast and super inexpensive. And that’s just Super! My old front porch rug got moved to patio step after I finished our Front Porch Makeover and I forgot about it when it started raining. It was already kind of tired from all the years on the front porch but after the rain it was looking pretty bad. Now it had dark areas from the water. My husband threw it out (it’s like he doesn’t even know me 🙂 ) so I retrieved it from the trash and put it in a safe place until I could work some paint magic on it. 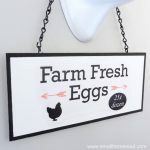 This post contains links to products, if you purchase something after clicking on my link I may earn a small commission (at no extra cost to you). 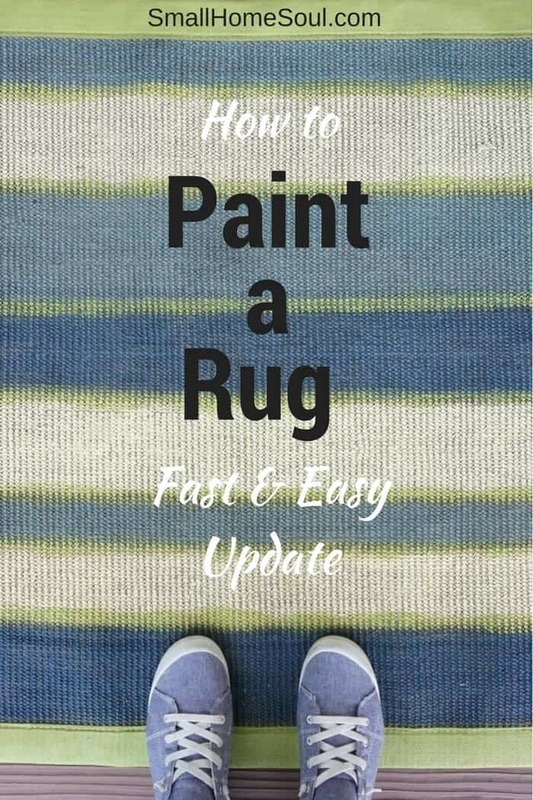 I’ll step you through the basic steps to update this rug. Look for and watch the video below where you’ll see an example of the technique and consistency of the paint from my first painted project. That’s about the same time my friend Janine painted her first rug. 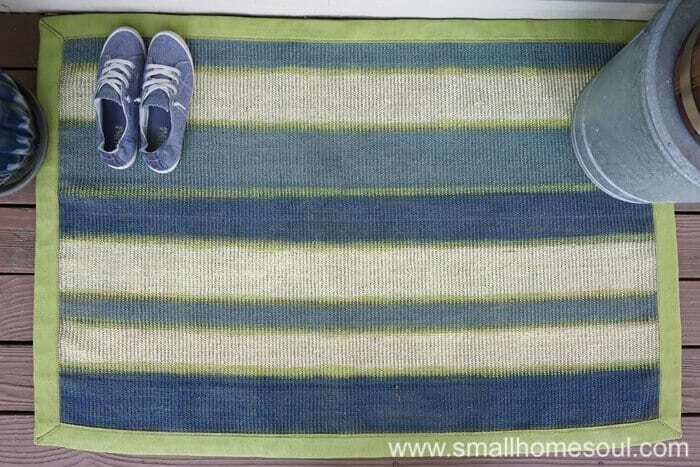 Give your rug a good vacuum or sweep your rug thoroughly. 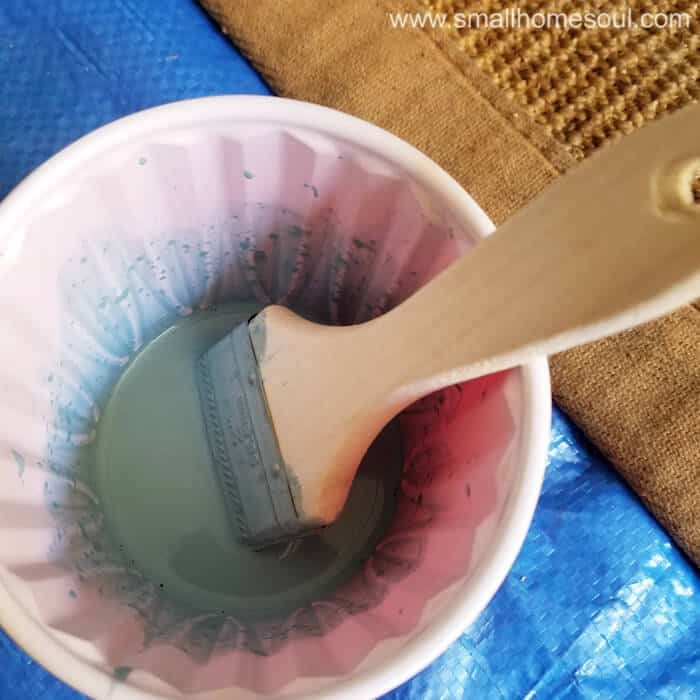 Thin the paint with water. Start with 1 part paint and 1 part water. Thinner is better. My rug already had strips on it which gave me a good pattern to follow. 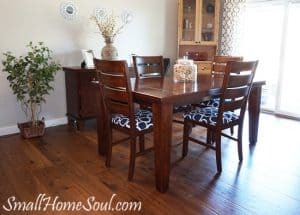 If you have a similar rug you can paint it one solid color but remember any color variation in the original rug may show through lighter paint. You can see above that 2/3 of the rug is darker. That’s where the rug got wet. And that’s why I went with multiple paint colors. 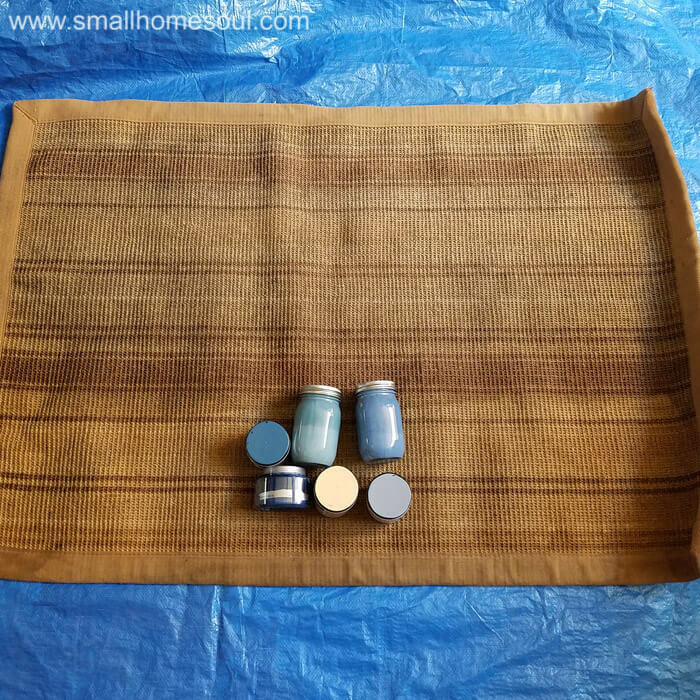 Lay your rug on a tarp or drop cloth because the thin paint may bleed onto or through the backing. Load up a chip brush with paint. 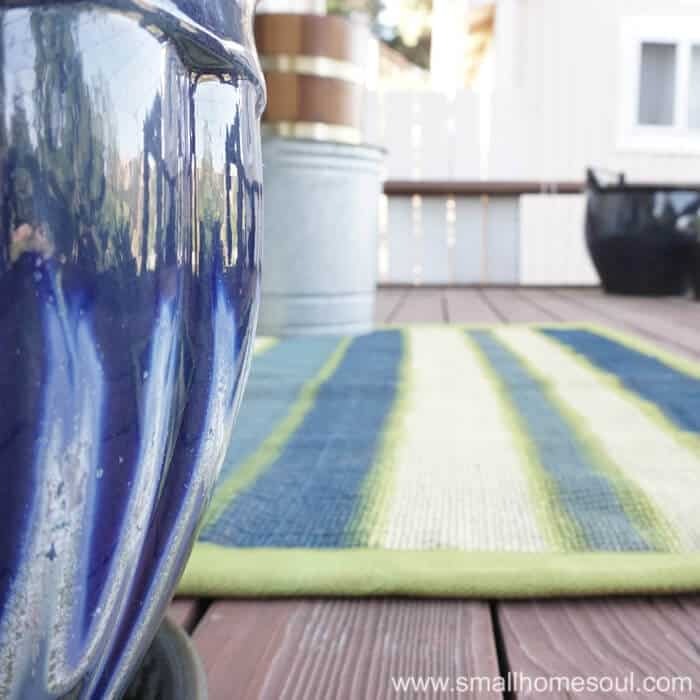 You can use a regular brush but the natural rug materials might be hard on good brushes. 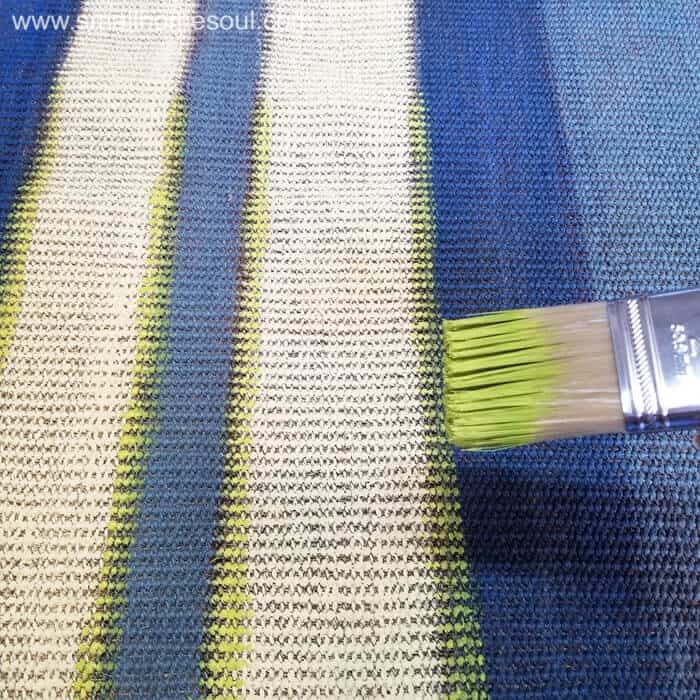 Lightly start applying the paint in small strokes with the weave of the rug. 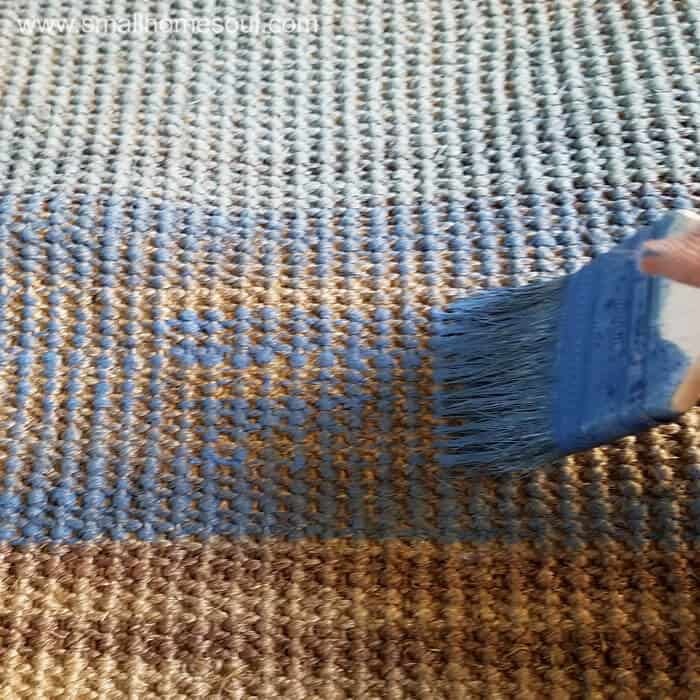 Keep loading your brush and applying until all the brown of the rug is covered. You’ll likely need a few coats. Don’t worry the thin paint dries pretty quickly. Keep working on your stripes/pattern applying additional coats until you get the color you want. Add skinny stripes or details. I added skinny stripes of green between the bigger blue stripes. I free-handed the stripes but use painter’s tape if you want. 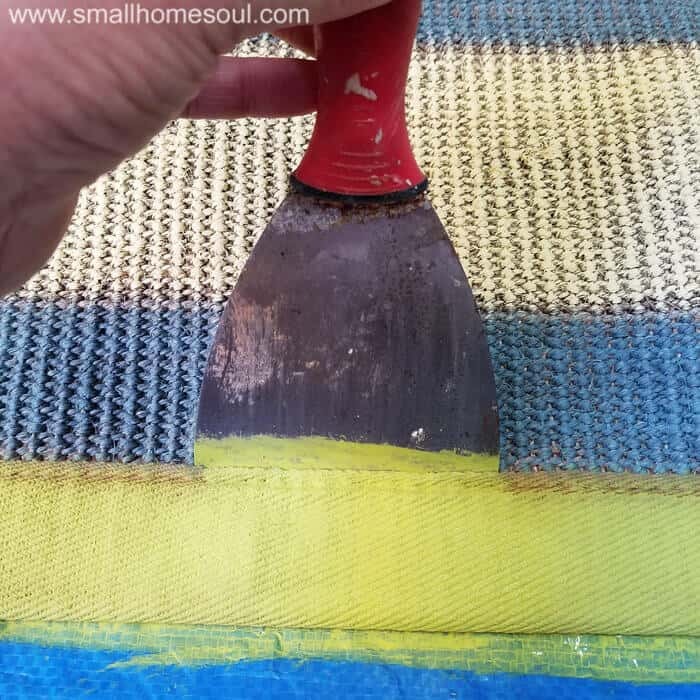 To paint the rug border use a large putty knife to protect the rug area while you apply paint the border. The border took a few coats to cover the original brown and to look rich. Let it dry fully before moving it to it’s new home. That’s all, it’s that easy to paint a rug and I just saved that old rug from the landfill as well as a few dollars from my pocket. I also have a bright update to my forgotten side deck. Let me remind you of the ugly before. And now the lovely after…. That was easy! It took me less than an hour to paint, it felt like therapy, and it looks brand new. If you want to see the technique up close and see how much I thinned the paint please check out the YouTube video below I made when I painted a larger rug a few years ago. I really love this idea Toni. We have lots of small rugs that are just blah! But with paint we can transform them into fun rugs instead. This looks awesome! I remember talking to you when I did mine and I’m super happy with how mine came out. Your rug is amazing and so pretty! Thanks Janine, I remember when you painted your rug too 🙂 yours turned out fantastic! This turned out great, way to save and restore it! Thanks Sarah, I’m so glad I saved it from the trash. What a great idea! isn’t it just amazing what you can do with paint! Love the colours you chose!! So bright and welcoming!! Sam, paint is amazing!! As you well know 🙂 I love how bright this rug is, it’s hard to believe that was on my front porch in such boring and blah tones for so long. Happy is what I was going for Michelle, I’m so happy you think so too. I love easy DIY projects. Toni!!! This is so cute. You did such a good job on it. I love it! Your paint job looks so much better. What a great refresh! 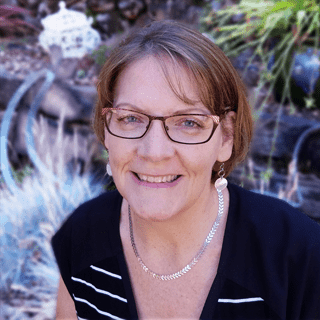 Thanks Claire, I can’t believe now how boring it was and for so long on my front porch. So hard to believe this is painted. It looks fabulous! Thank you Janice, it’s amazing how quickly you can change these rugs with a little paint. That is magic! I love your second version so much I would have painted it right away….but maybe it was faded, right? I remember that seagrass rug you did too. I love that you salvaged a throw away and turned it into an eye catcher. Thanks Debbie, the lighting in my pictures might be off a bit. It’s the same rug, and some of the closeups were with fresh paint. These rugs will absorb the paint, thus the few extra layers. I’m so glad you like it! I have some older rugs and I am updating my homes colour scheme. This is so much better than buying new rugs. Thanks for the tutorial. 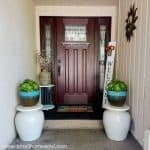 Leanna if you have natural fiber rugs you must try painting one of them. You’ll save so much money over buying new ones. Wow, I just love this technique. The colors really pop! What a great idea. You turned it from boring to beautiful! Carolann this technique of thinning the paint works so much better than trying to load up the rug with paint. I’m so happy you think it’s beautiful, I do too.